Switcheroo - The Chip's Challenge Wiki - The Chip's Challenge Database that anyone can edit! Green buttons control toggle doors. 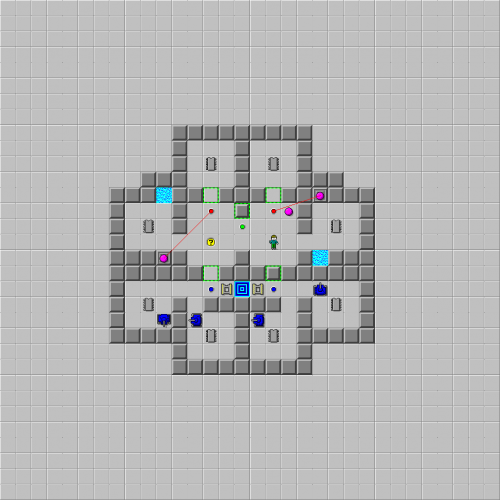 Blue buttons control tanks. Red buttons activate clone machines. 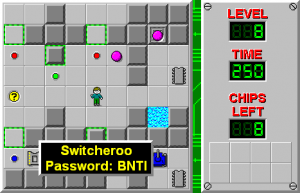 Switcheroo is the 8th level in Chip's Challenge Level Pack 1, and the eighth of the lesson levels. This level is all about green, blue, and red buttons (the brown button was introduced in the previous level). Start off by heading to the lower-left corner with the tanks and get the chip beneath you followed by the chip on the left. The other two chips in the left wing can be taken without issue, as the clone machine on the left is currently not being activated. Press the green button twice to move the pink ball out of your way to get the chip above it. Press the toggle button once again and collect the chip on the rightmost side of the level, which is now possible to get since the cloning has stopped. The only section that now remains is the SE with more tanks; finish this area and you can exit without any issue.